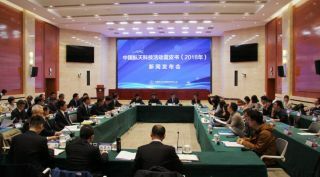 A CASC news conference in Beijing Jan. 29, 2019. HELSINKI— The main contractor for the Chinese space program is planning more than 30 launches in 2019, with major missions including the crucial return-to-flight of the heavy-lift Long March 5 rocket in July. The China Aerospace Science and Technology Corporation (CASC), announced Jan. 29 that it would aim to loft more than 50 spacecraft on 30-plus launches this year. Among these will be the third launch on the Long March 5, a 5-meter-diameter, 57-meter-tall heavy-lift launch vehicle which failed in its second flight in July 2017, delaying the Chang'e-5 lunar sample return mission and the construction of the Chinese Space Station. The mission will take place in July at the coastal Wenchang Satellite Launch Center on Hainan island, CASC vice president Yang Baohua said at a Jan. 29 news conference in Beijing, which also saw the release of a "Blue Book of China Aerospace Science and Technology Activities." A redesign has been carried out to the liquid oxygen and liquid hydrogen YF-77 engines, two of which power the Long March 5 first stage, to correct the turbopump issue reported to be behind the 2017 failure. The return-to-flight mission will carry the Shijian-20 communications satellite, or "Practice-20" in Chinese, based on a new, large DFH-5 satellite platform which supports satellites from 6,500 to 9,000 kilograms. A successful launch would mean the fourth Long March 5 would then be used to launch the Chang'e-5 lunar sample return toward the moon in late 2019. The mission will aim to collect up to 2 kilograms of rocks and regolith from a site near Mons Rümker in Oceanus Procellarum on the lunar near side and bring the samples to Earth. A nominal return-to-flight would also clear the way for the test launch of the Long March 5B, a variant of the Long March 5 designed specifically for lofting the 20-metric ton modules of the planned Chinese Space Station (CSS) into low Earth orbit. CASC official Shang Zhi told China's state-run Xinhua news agency that joint tests and exercises involving a test model of the rocket and the CSS core module will be carried out at Wenchang at the end of 2019 in preparation for the maiden flight of the Long March 5B. Launch of the first CSS module is currently slated for 2020. CASC did not release a full, detailed launch manifest, keeping the nature and name of many of planned missions unstated, as is standard for China's space activities. Those plans revealed include the launch of a further 10 Beidou positioning, navigation, and timing satellites through seven Long March 3 series launches from Xichang, southwest China, as the country pushes to complete its own rival to the U.S Global Positioning System (GPS) constellation in 2020. Other missions stated include the Gaofen-7 Earth-observation satellite, to add to the country's high resolution civilian remote sense constellation, and the second launch for the Hongyan low earth orbit communications constellation. The Long March 11, the only solid-propellant launcher in the Long March family, will have its first sea launch around June, utilizing a converted vessel to provide low inclination launch opportunities. The Chinarocket Co., Ltd., operating under CASC, will also launch the first 'Smart Dragon-1' (Jie Long-1) solid micro launcher, designed to carry up to 150 kilograms into a 700-kilometer sun-synchronous orbit, adding further competition to the small launcher market in China. In addition to CASC's activities the Chinese private launch firms OneSpace and iSpace will also be attempting their first orbital launches in the first half of 2019, with the China Aerospace Science and Industry Corporation (CASIC), a sister state-owned enterprise to CASC and major missile developer, to carrying out launches of its solid-fuelled Kuaizhou-1A and Kuaizhou-11 rockets. CASC carried out 37 launches in 2018, all successful, including the Chang'e-4 lunar far side landing mission, the first Hongyan LEO communications satellite, 18 Beidou satellites as well as science, weather, communications and remote sensing satellites for a range of civilian and military applications. China's previous highest annual launch rate was 22, set in 2016, which included one failure and a partial failure. The greatly increased cadence saw China account for roughly a third of the 103 global launches, putting it ahead of the U.S. and Russia for the first time, as the country continues to establish a range of space-based infrastructure and capabilities. A statement earlier this month following the group's annual 'work meeting' stated that CASC's revenues increased year-on-year by 8.6 percent to 251.3 billion yuan ($37.3 billion) in 2018, with total profit growing 5.6 percent to 20.73 billion yuan.